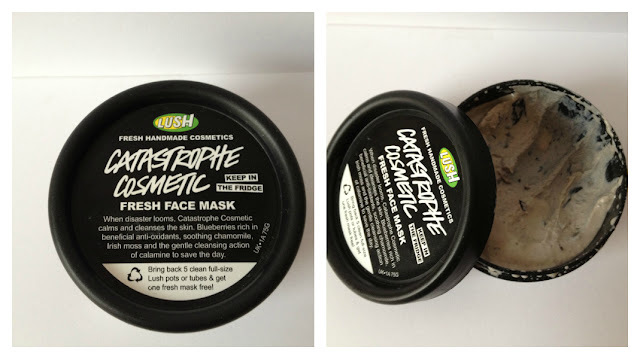 Another Dave purchase for me (I know - I am very very lucky) and this time it is the Lush Catastrophe Cosmetic Fresh Face Mask. I do love Lush but the nearest shop to me is a good 30 minute drive away so I have to yearn for products from afar. This wasn't the face mask I wanted on my wish list from my 100 Day Challenge but it was the one that piqued my interest the most whilst in the shop. THEY SAY: When disaster looms Catastrophe Cosmetic calms and cleanses the skin. Blueberries rich in beneficial anti-oxidants, soothing chamomile, Irish moss and the gentle cleansing action of of calamine to save the day. I SAY: Well first off I'm not fond of putting cold things on my face so the fact that this is a mask that has to be kept in the fridge filled me with a kind of weird-angsty feeling (cold + wet, slimy, in any way moist near my face = panic. It's a suppressed childhood thing apparently) but I bought myself round and slapped it on anyway. The first time I used it I had a sneezing fit half way through wearing it, at which point it was dry, and therefore my face spasms caused it to crumble off my face. Avalanches leave less mess. Dave asked me if the landlord had been round (he's a builder) as there was a trail of greyish dust throughout the house. The more I sneezed the more the mask crumbled thus creating dust which made me sneeze again. Please don't wear this mask if you have a cold. The second attempt was more successful. The mask itself is quite thick so I can squeeze three uses out of the tub but a couple of the blueberries fell off my face (much to the joy of the cat that decided they were on the floor to be 'hunted'). It's lightly perfumed, smelling vaguely of fruit. I left it on for the required 10 - 15 minutes whilst it worked it's magic. It left my skin feeling soft and cleansed. It even reduced the redness around a couple of the flare ups I have been experiencing recently. I really enjoyed using it actually and yes, I would recommend it. In fact, with my Birthday coming up, I might ask my family to get me some Lush vouchers so that I can try some others. Any suggestions for me? Lush Catastrophe Cosmetic Fresh Face Mask is available in Lush stores or online for £5.95.